A meet-up with Gideon Decker will ruin a man’s day, heck -- make that his life. 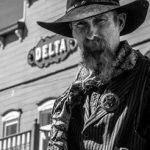 This highly-skilled gun-for-hire can hit his mark, spot-on, whether from a speeding stage coach or perched perilously on some crumbling cliff side. The Texas Rangers have tried repeatedly to recruit him but he demurs, saying he prefers independence to hierarchy. Though it is said he'll do anything for the right price, he follows his own code of ethics and has helped everyone from bankers in Wyoming to miners in California, which has spread his reputation far and wide. Born and raised near an indigenous tribe in Wyoming, Decker often played bow and arrow with the native children and in friendly competition was the “the one to beat”. Today, everyone west of the Mississippi knows that you don’t have a prayer with Gideon Decker comes calling.